Personal healthcare is getting more innovative and advanced every day. There are so many apps, gadgets and devices, sometimes it can be hard to keep up and ensure you have the right information for your health needs. Especially when it comes to the heart. The latest advancement in hearth health monitoring is from Apple. You can now take a short ECG reading with the ECG app on the Apple Watch Series 4. This will hopefully mean a more widespread awareness and monitoring of heart health – which is great news. But exactly how does the new Apple Watch ECG work and what are the limitations to be aware of? As the leading digital heart health company, we explain the new ECG functionality of the Apple Watch, and look at the different ECG options available, to ensure you look after your full heart health. What is an ECG? And what is an ECG test? ECG is an abbreviation of electrocardiogram. It is the process of recording the electrical activity of the heart over a period of time using electrodes placed over the skin. An ECG test uses an ECG monitor and measures the electrical activity of the heart and the heart rhythm. This is then displayed as line tracings on a moving strip of paper, or digitally as a line on a screen. The spikes and dips in the tracings are called ECG waves. The results of this ECG reading then needs to be reviewed and analyzed by a cardiologist or specialist for abnormalities or possible heart problems. Why is having an ECG important? Cardiovascular diseases are the number 1 cause of death globally. More people die annually due to a heart related problem than any other disease. Luckily, most heart problems are preventable. An ECG test helps screen and detect a variety of cardiac problems such as arrhythmias, cardiac arrest, heart defects, heart attacks and much more. It’s the most common way to check if your heart is healthy or monitor existing heart diseases. Checking on your heart health is important because many heart problems are without symptoms. Also if left undetected, and therefore untreated, it could lead to further heart problems or worse. Having an ECG test done periodically is easy, highly beneficial and lets you and your doctor keep an eye on your heart health. As your heart matures your ECG trace might change, so performing an ECG from time to time and keeping a history of your traces can help spot changes sooner, and allow for a faster treatment to prevent further health problems. How does the new Apple ECG app work? The new Apple app can perform an ECG similar to a single-lead ECG. This records your heartbeat and heart rhythm using the electrical heart sensor on the Apple Watch Series 4 and thenchecks the recording for atrial fibrillation (AFib), a form of irregular rhythm. This reading is done off your wrist and you can take an ECG at any time, when you’re feeling symptoms such as a rapid or skipped heartbeat, when you have other general concerns about your heart health, or when you receive an irregular rhythm notification. You open the app, follow the steps and the recording takes 30 seconds. At the end of the recording, the app gives you a heart rhythm classification of either a ‘Sinus Rhythm’ which is a normal beating pattern or ‘Atrial Fibrillation’ (AFib) which is an irregular beating pattern. You can share your results with your doctor via the sharing functionality so your doctor can advise what to do if a Atrial Fibrillation event was detected. This ECG functionality of Apple Watch 4 series is currently only available in the US, Virgin Islands, Puerto Rico and Guam. What is the difference between Apple ECG and other ECG monitors? Today the most common way to get an ECG reading is in a hospital or a doctor’s office. It involves skin preparation and electrodes attached to the chest with conductivity gels and wires that channel the traced data to the ECG machine. For an ECG test longer than a few minutes, a holter monitor would be used, which is a “portable” version of the hospital ECG machine, but which still uses gels, wires and patches to detect, record and store the ECG trace while you go about your life. Holter monitors are usually used to monitor the heart for several days as opposed to a short ECG reading done in the hospital. 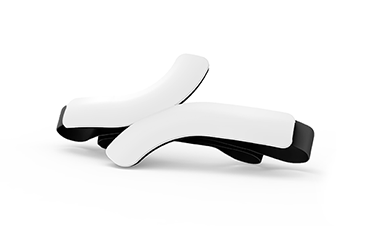 QardioCore is a next generation holter monitor that performs a medically accurate ECG test without the need for wires or patches and it doesn’t require a professional fitting the way traditional holters do. It also works with an app so you can build your ECG history over time and share it with your doctor. Apple Watch Series 4 offers a lifestyle friendly way to record a short 30 second ECG trace anytime, anywhere. Its ease of use and wide availability means more people can screen for a possible Atrial Fibrillation, one of the most common heart problems today. 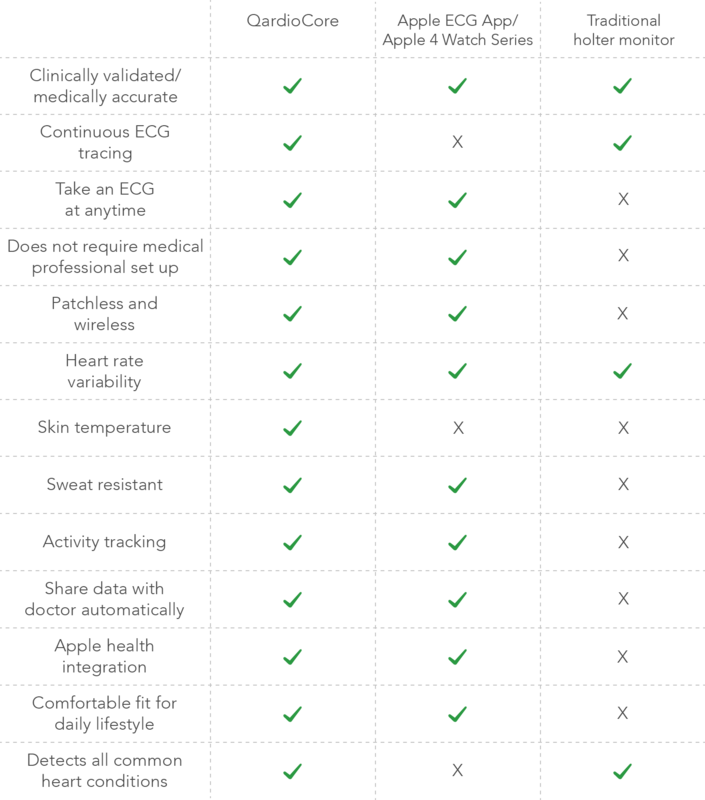 Below is a table which explains the range of heart rhythm monitors available. Apple Watch Series 4 new ECG features is a real game changer in heart health, offering a simple yet powerful way to keep your heart checked without the need to visit a doctor. If your Apple Watch detects a possible heart problem, your doctor is likely to perform further tests using traditional ECG monitors or QardioCore that can give a more in-depth, detailed view into your heart. 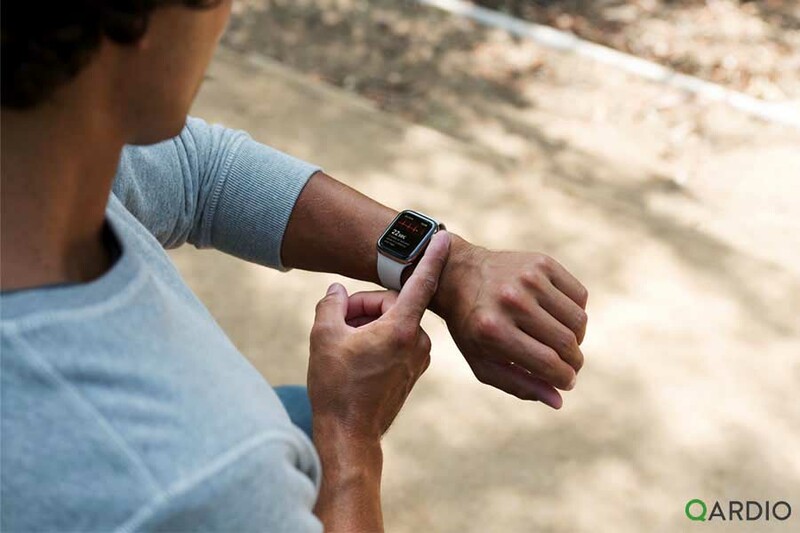 But the availability of the simple test, such as the one Apple Watch Series 4, now offers the first step towards a better awareness and an easy way to screen for possible heart problems. Take the first step to better heart health with the Apple ECG app. For a full understanding of your heart and continuous tracking of your ECG, QardioCore offers a lifestyle friendly way to track your heart on the go and share your heart readings with your doctor. Invest in your health with technologies that help you live a healthier longer life and give you peace of mind.